sciences professionals and singing and voice teachers. Listed here are our bestselling models. 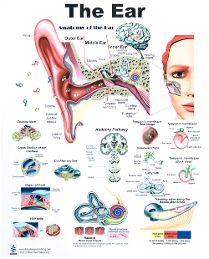 Excellent for client education, these posters are portable, durable, can be used with dry-wipe markers and are excellent in clinic or studio. Each poster is 432x305mm (17x 12") in size and Priced at £25 each. This small (approx 20cm square) rubberized anatomy mat has proved a great hit - with voice professionals in client education and also with singing teachers, where it resides on the piano. Portable and featuring a 3-D relief that gives depth to the detail for a greater appreciation of anatomy. If you don't have one, order a piano right away! This small (approx 20cm square) rubberized anatomy mat is an excellent tool for hearing professionals in client education. 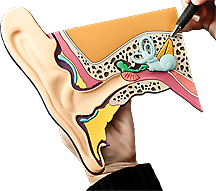 The Ear Anatomat is durable, portable and features a 3-D relief that gives depth to the detail for a greater appreciation of anatomy. 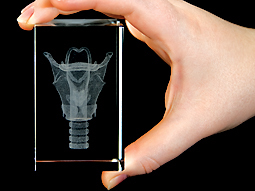 At three inches high, this model features a lasered 3D image of trhe human larynx. Perfect for client education - or even as a gift to colleagues or clients. Weight 1 pound.